SECAUCUS (WABC) -- Police say they have captured a man wanted in a fatal stabbing in Troy, New York after a chase that ended in New Jersey. The suspect, 45-year-old David Campos, was taken into custody in Secaucus Monday morning. Authorities say Campos is suspected in the stabbing of a woman in her 40's in what appears to be the result of a family dispute. Police say Campos stabbed the woman in Troy at about 5:40 a.m. Monday, then took off in a black 2015 Chrysler 200. He was spotted on the Palisades Parkway in New Jersey near Fort Lee and authorities gave chase. Just south of Interchange 1 in Englewood Cliffs, police say the vehicle crossed the Parkway into oncoming northbound traffic, drove through a Sunoco gas station, and exited into Fort Lee, eventually crossing onto Route 1 & 9 south. 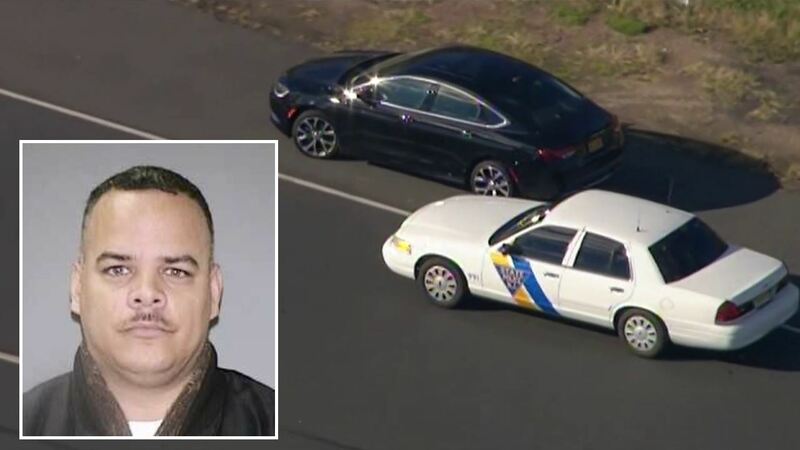 Police followed Campos onto the southbound eastern spur of the New Jersey Turnpike before apprehending him at milepost 112 in Secaucus, where he was stopped in traffic at the 16W toll plaza.